Morena is having lot of fun creating new useful objects with her designs. Rightfully, as she’s a 3D modeler by profession, even if normally only for digital cartoony characters. 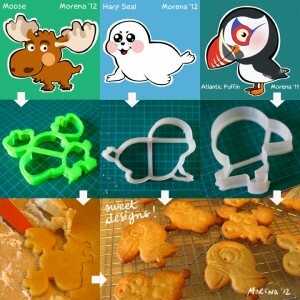 “Here the first 3 animals converted to cookie cutters! We’re starting experimenting since a while and I have to say it’s much harder then expected. Other than the tecnical difficulties that the machine and softwares brings, I needed to make a number of versions to understand how to make a functional design for good cookie cutters (thanks Kathrine for sweets cookie alliance).